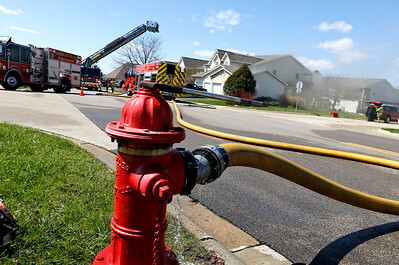 H. Rick Bamman - hbamman@shawmedia.com A hydrant supply water to the fire scene at 11 Acorn Ave. in Lake in the Hills Monday. 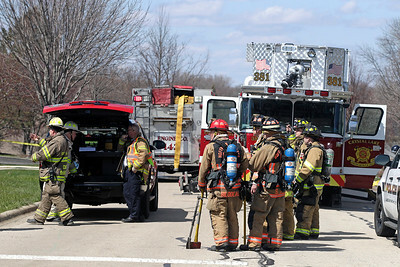 Police closed West Acorn Lane from Crystal Lake Road to Randall Road. 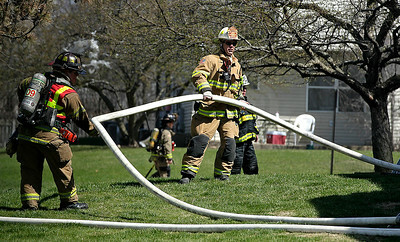 H. Rick Bamman - hbamman@shawmedia.com Firefighters gather on the front lawn of a town home at 11 Acorn Ave. during a second floor fire on Monday. 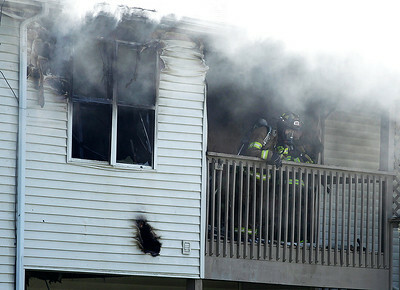 H. Rick Bamman - hbamman@shawmedia.com Smoke billows from the second floor on Monday as firefighters gather on the balcony after containing flames in a town home at 11 Acorn Ave. in Lake in the Hills. H. Rick Bamman - hbamman@shawmedia.com Fire fighters reposition a hose as a crew enters the building to look for hot spots on Monday during a fire on the second floor of a town home at 11 Acorn Ave. in Lake in the Hills. 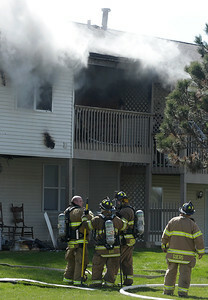 H. Rick Bamman - hbamman@shawmedia.com Smoke billows Monday from the second floor of a town home at 11 Acorn Ave. in Lake in the Hills as a crew of firefighters waits to be deployed at the scene. 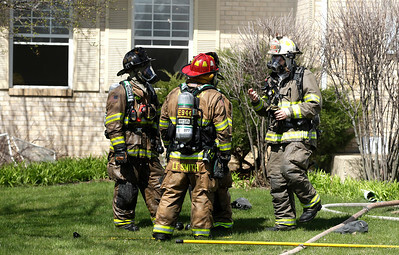 H. Rick Bamman - hbamman@shawmedia.com Firefighters work the scene Monday at 11 Acorn Ave. in Lake in the Hills. 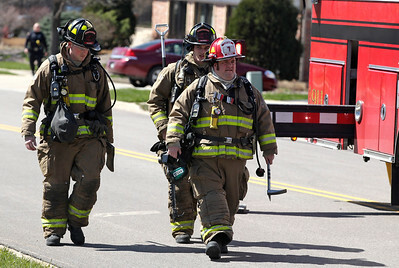 H. Rick Bamman - hbamman@shawmedia.com Firefighters from Nunda Township arrive to assit Lake in the Hills crews as they work to contain a second floor fire in a town home at 11 Acorn Ave. on Monday. 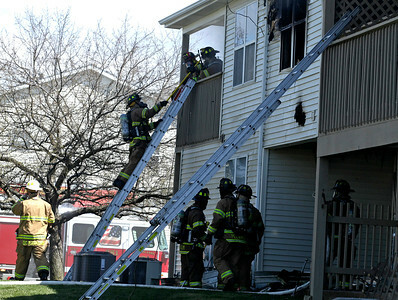 H. Rick Bamman - hbamman@shawmedia.com A fire on the second floor of a town home at 11 Acorn Ave. in Lake in the Hills closed West Acorn Lane from Crystal Lake Road to Randall Road on Monday. 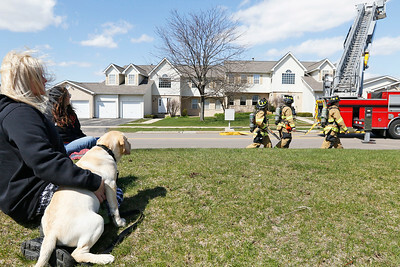 H. Rick Bamman - hbamman@shawmedia.com Lake in the Hills residents Karen Daley (back) and Kristina Keacher with her Lab Beau watch as firefighters stage report to the scene at 11 Acorn Ave. Smoke billows Monday from the second floor of a town home at 11 Acorn Ave. in Lake in the Hills as a crew of firefighters waits to be deployed at the scene.